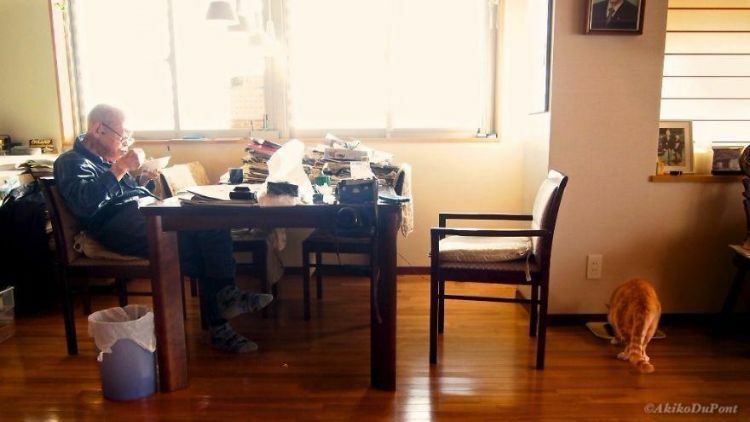 Akiko DuPont's grandfather worked for 64 years, until the day he fell ill and couldn't go back to work. That's when he lost his smile and changed from a happy, cheerful Grampa to a never-smiling, unhappy Grumpa. 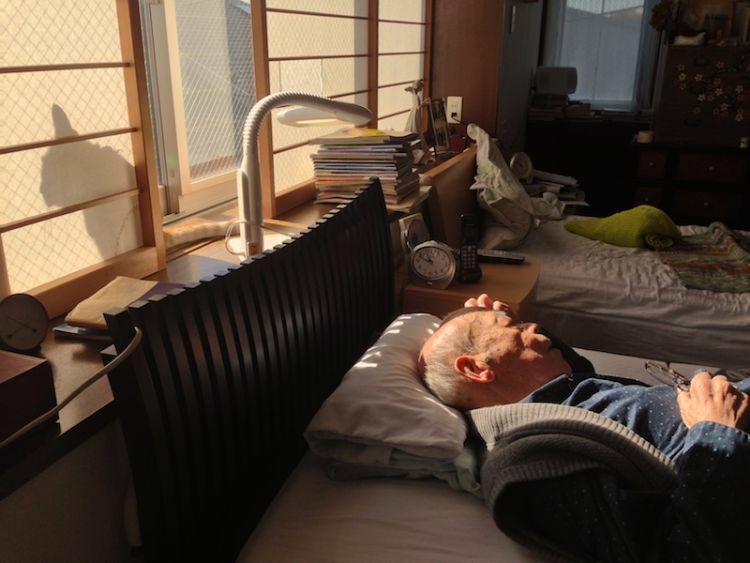 Then Akiko did something to turn his life around. 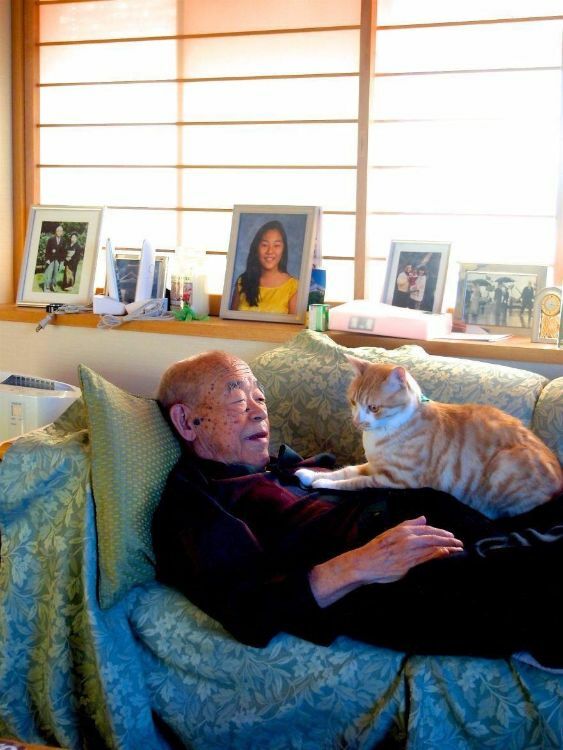 She brought the 94 year old man a ginger tabby named Kinako. 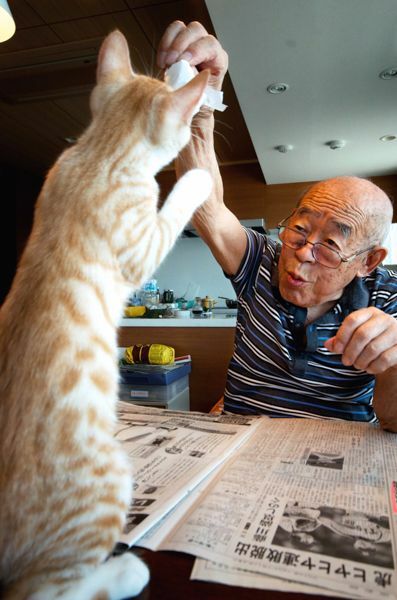 Jiji, the old man, and Kinako hit it off immediately. Where once Jiji was miserable, he became satisfied and content. Kinako accompanies him wherever he goes, following him around the house like a, well, a dog. 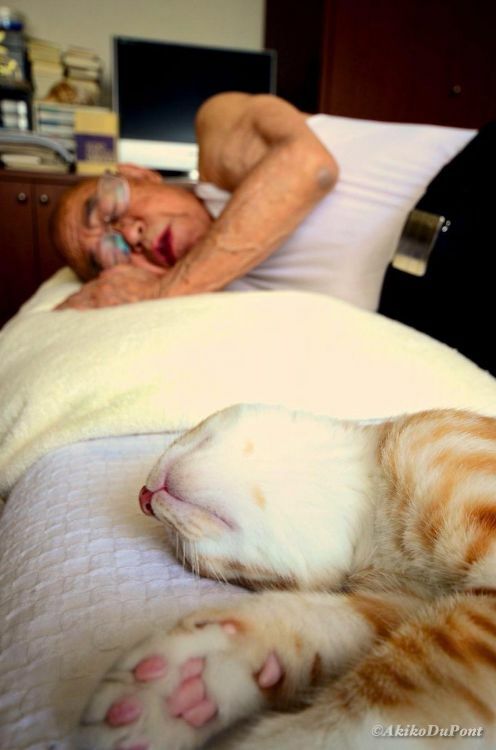 ...to sleeping. Sharing a bed is a great way to take a nap, and the two friends love to spend snooze time in each other's company. 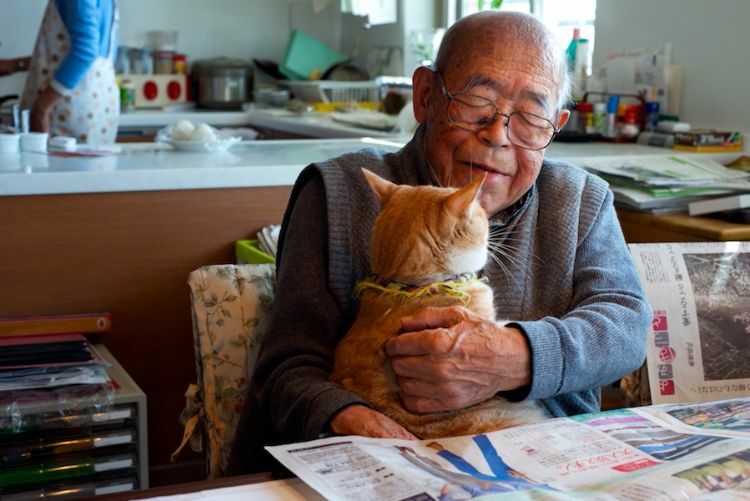 Kinako's soft purrs and gentle ways are helping the elderly man heal. 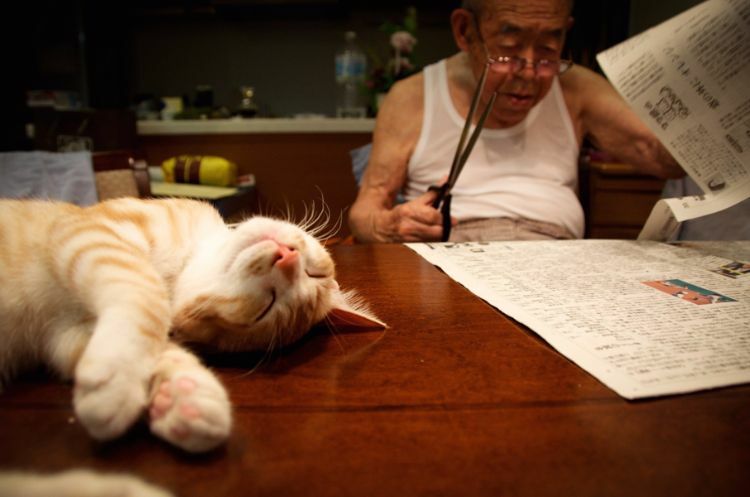 It's a medical fact that pets can have a positive impact on the ill and old. Kinako is just what the doctor ordered! 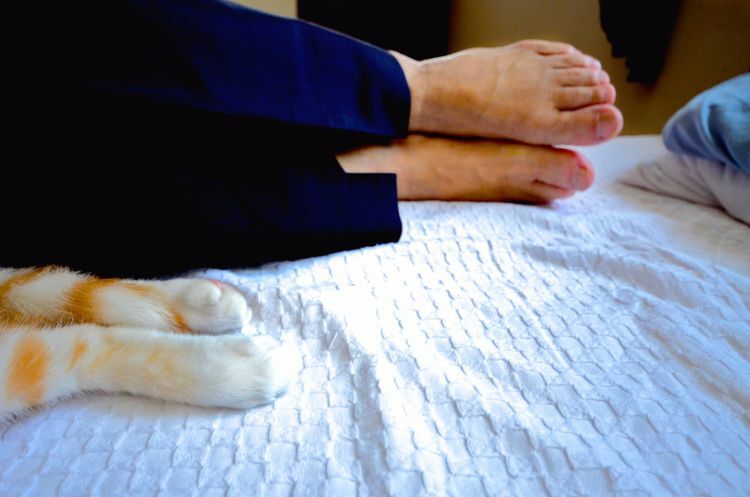 A relationship with an animal has been shown to reduce blood pressure and enhance healing. Jiji may not know how it works, only that it does. And that's enough for him. No matter what Jiji is doing, Kinako is always close at hand. Jiji has found a way to cheer himself up by playing with the ginger cat, and Kinako is more than willing to play along. Although sleeping on the same bed is one of their favorite pastimes, they don't always spend their time together lying down. 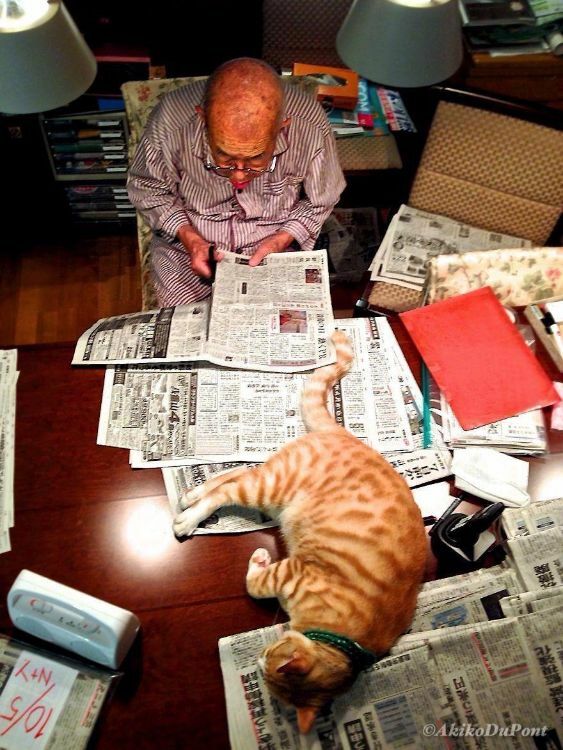 There's a lot to do keeping up with the goings on in the world, too. Jiji is always a bit more interested in world affairs than is his feline friend. Do you have a pet that could cheer someone up? 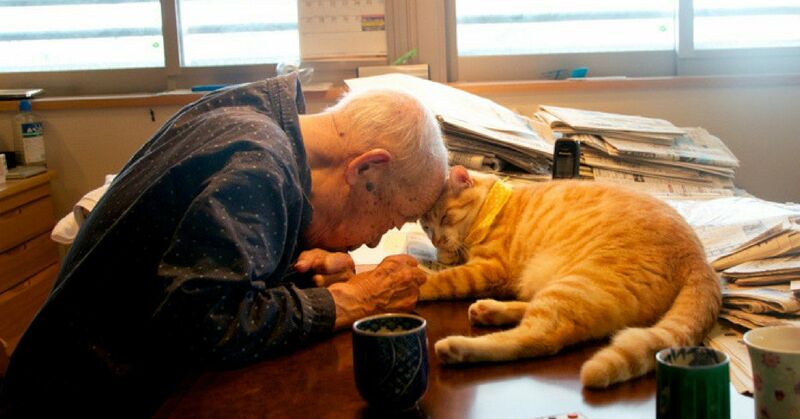 Consider taking it to a retirement home, where many residents have had to leave their own furbuddies behind. With the difference Kinako has made in Jiji's life, your own pet just might be a game changer, too! To find out how you and your pet can help, check out Pet Partners.org.